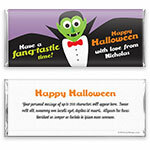 Frightfully fun, this Count Dracula wrapper design is the perfect choice for a favor your friends can really sink their teeth into! Design: Friendly vampire with bow tie and colourful text. 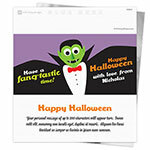 Personalization: Front greeting with back title and message.